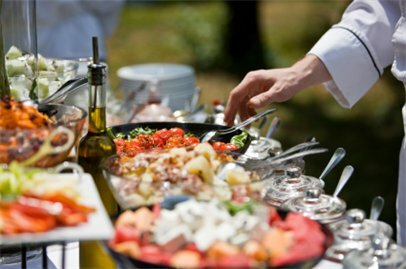 Chef Tarla caters parties that serve from 2 - 250 people, customizing each event to her clients' needs. Her professional staff sets up the buffet tables, serves meals, bartends, and cleans up. Tarla uses her creative talent as well as extensive research at restaurants all over the world to create her Culinary Inspirations. Catering prices and staff size are based on the menu, number of guests, and type of event. Contact Chef Tarla today for additional information and pricing at Tarla@TarlaCuisine.com or by calling (949) 854-9490. Tarla's events are fully customized to your preference. Please click on the proceeding link for a Sample Dinner Menu from a previous party. Nice words for a catering professional. I hope she also succeed in her catering business. very nice post, looks like she very hard working and i think hard work pays. Thanks for your sharing this post. I will recommend New Orleans Bar and Grill for catering services in Greensboro. Je tiens à vous remercier pour cette lecture instructive; J'apprécie vraiment partager ce grand. My hunt for the best Contract Caterer in Birmingham ended at Tangfood.co.uk and it helped me to offer the fresh and tasty food to my guests during the weekend party.